Soooo … it’s June, and it feels like my year is just beginning. After the postdoc application, which nearly killed me, I finished my book proposal for Finding Maud, my memoir about deafness. I’ve also been teaching creative writing at the University of Queensland one day a week (on top of my other job), which has been fantastic, but it requires truckloads of energy, at least for a deaf person. I only have one more batch of marking to do, then presentations at a workshop, symposium and two conferences, and I’ll be a free agent again. And so, after a blogging hiatus on account of my perpetual exhaustion, I’m penning my first review for the Australian Women Writers Challenge (better late than never!). Emma Ashmere’s very pretty novel, The Floating Garden, has been sitting on my desk awaiting a review all this time. I was approached by Spinifex Press to write a blurb for the book, and my beau & I intended to travel to Mullumbimby for Emma’s launch, but the heavens opened that Friday and it wasn’t safe to travel, so we sadly rainchecked the trip. With its pellucid prose and descriptions of gardens and early 20th century spiritualists, I loved this novel. It opens in the bedroom of a boarding house run by Ellis Gilbey, in which everything is ‘coated in a chalky sheen’ (3) from the construction of the nearby Sydney Harbour Bridge. Ellis is a quiet, self-contained woman, who shies from the intrusive interest of others. She loves women, writes a gardening column under a nom-de-plume, and is being kicked out of the boarding house to make way for the bridge. Her story intertwines with that of Rennie, an English artist married to a wealthy, brutal man. 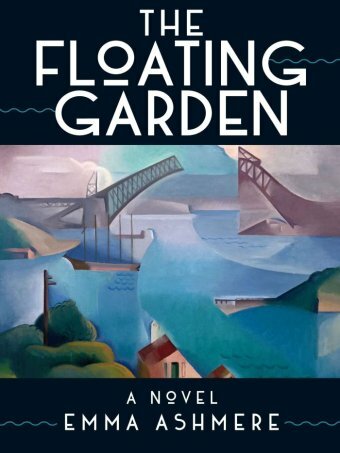 While elucidating their painful relationship and Rennie’s hopes of flight, the narrative delves into Ellis’ escape from the country as a girl, and how she fell in with theosophists in Sydney and fell, too, for a fellow performer. I thoroughly enjoyed the descriptions of spiritual chicanery, being familiar with them from my research on Rosa Praed, who was a theosophist (among many other religious persuasions). When Ellis and Rennie cross paths, the story shifts to Lane Cove and to a beautiful garden: ‘Tufts of nodding russet-coloured grasses were alive with the whirr of insects. Drifts of white flannel flowers brightened an untamed bed of greenery. Beside them waratahs raised their waxy flaming heads. Wattle trees draped across the path. Green and red kangaroo paws raised their slender hands to the sky’ (223). By the end, both women, although not entirely comfortable with one another, still find niches into which they nestle. This novel is driven by character rather than plot. I like people and so I enjoy these kinds of books, but what I enjoyed even more was the evocation of 1920s Sydney and the wealth of sensory description – not just visual details, but touch and smell as well: ‘The smell of the man's tobacco threaded towards her on the wind. There was another smell, the smell of spring, of working with her mother in the garden before the drought’ (28). These details brought the novel to vividly to life. The descriptions of women’s clothes was also charming. At a gallery exhibition, Rennie’s friend shrieked ‘amid a frisson of beads swinging wildly from a dress cut so low at the Back Rennie couldn’t help but stare down the slender ravine of Bertha’s derriere’ (19). Fashion is also used to delineate class. On meeting Rennie, Ellis observes how ‘her hat was made of fine pale straw, fashionably moulded to the head. Against the falling darkness of the street, smoke swirled around her in a diaphanous cape. Her silk white stockings glimmered against the cobblestones as if her torso had been set on two pillars of light. Ellis’ eyes went to the woman’s lapel where a yellow rose rested its delicate head against a spray of ivy leaves’ (107). Thematically, the novel evokes the marginalisation of lesbians and their stories. It focuses not on the arches of the Sydney Harbour Bridge, but what happens at its feet. The setting suggests that we should not always focus on dominant, obvious narratives, because what happens in their shadow is equally interesting. Emma spoke about her novel on ABC Radio, and you can listen to it here. This sumptuous book was a joy to read, and it’s apt that it has kicked off my reviewing, however belated, for the Australian Women Writers Challenge. I'm really looking forward to seeing what Emma does next.